By 2018, an estimated 581,500 people will have jobs in the nursing field according to research by Johnson and Johnson. Some of those will have graduated from OCCC with a little help from a new scholarship program. OCCC will offer its first BADNAP Booster Scholarship program starting this fall, said Jana Wade, Admissions adviser. The Booster Scholarship is a tuition waiver that would cover the costs of any required prerequisite courses students would need prior to entering OCCC’s Baccalaureate to Associate Degree Nurse Accelerated Pathway program, she said. “An associate degree in nursing at OCCC requires a minimum of 74 to 75 credit hours, with 38 to 39 of them being general education and support credits,” Wade said. “[Those] courses must be completed prior to application to the BADNAP Program. These are the courses that the scholarship will cover.” BADNAP is an accelerated program designed for students who have completed an undergraduate degree in a field of study other than nursing but who plan to get an associate degree in the nursing field, Wade said. The program allows students who have earned a bachelor’s degree in a field other than nursing to complete an Associate in Applied Science in Nursing in as little as 10 months. Recruitment and Admissions Director Jon Horinek said nursing is one of OCCC’s most popular majors. “The BADNAP Program is a great way for students to complete our nursing degree program faster,” he said. “Although OCCC has one of the lowest tuition and fee rates in the states, we know that students who are making major degree changes need assistance doing so. Wade said since students about to enter the BADNAP program already hold bachelor’s degrees, that makes them typically unable to get financial aid until after they are accepted into the program. She said the college created the Booster Scholarship to encourage students to take advantage of the program and to help reduce out-of-pocket costs. The BADNAP program is competitive, Wade said, on average accepting only about 72 students annually. “The program is very successful and it attracts the top qualified students each year,” she said. • Have earned a bachelor’s degree in an area other than nursing. • Have held a GPA of 2.50 or higher. • Maintain a GPA of 3.0 or higher on OCCC coursework. • Have a diversified studies contract on file with OCCC. • Complete at least six credit hours per semester to maintain the BADNAP Booster Scholarship. “I really encourage students to find out if they are eligible for the BADNAP Program as well as the BADNAP Booster Scholarship,” Wade said. The deadline to apply for fall 2014 is Aug. 1. 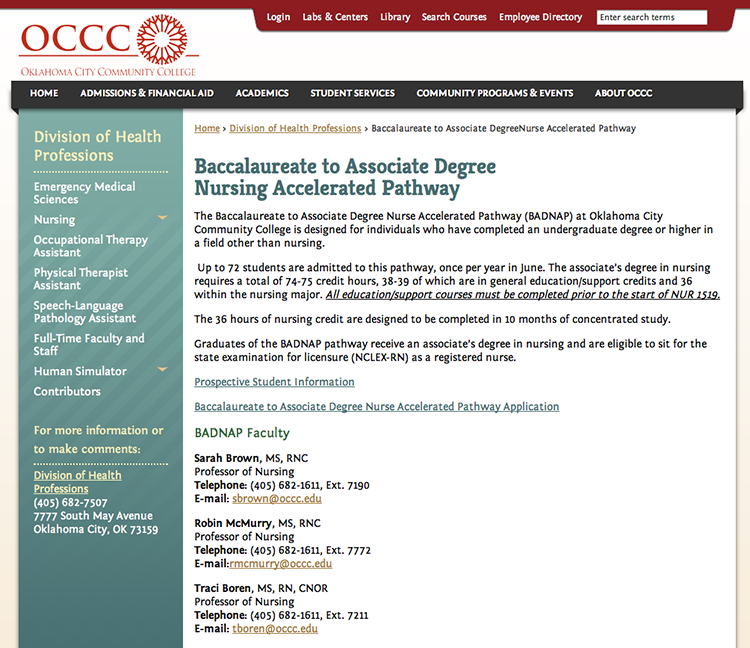 An online application and more information can be found at www.occc.edu/health/baccalaureate.html or by calling Horinek at 405-682-1611, ext. 7743.